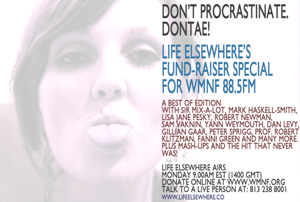 “Best of Life Elsewhere” (thus far) Edition is available on Podcast! If you want to get a taste of Life Elsewhere, this is the way to do it. A reel of some of our best moments of 2013 so far on Life Elsewhere with the one and only–Norman B.